All I can say is that I am pleased I wasn't seriously ill or dying. If I was I would have died trying to open a file. My appointment with the visiting dermatologist from the UK was at 10am. I was told to open a file first. Nobody actually explained the process of opening a file to me, and believe you me, there is a process! At 8.30am I stood in a queue that moved forward painfully slowly as there are always people who join the queue from the side, and always join it in front of you. After fifteen minutes the queue dissolved and expanded sideways into a mass of people all pushing and shoving to get to the front. After elbowing my way to the front after what seemed to be an unusually long time of jostling, I was told to go to the next window. Another queue just as wide as it was deep. Have I ever mentioned how I hate waiting? And I couldn't even read my Kindle because I had to stand the whole time and try and keep my place by using my elbows to keep out those trying to push in. Luckily, I perfected the skill of elbowing during numerous train trips to Shanghai when I lived in China. When I finally got to the front of the second queue, I was told to go back to the first queue. I nearly burst into tears. My chest started closing and I could feel a panic attack developing. By this time it was 10.15. I had been queueing for an hour and forty-five minutes and had achieved nothing. Like a sheep I joined the next queue, in my heart knowing it was a waste of time. If I didn't have this strange growth jutting out of me I would have left. A kind nurse in another queue asked me if I had a piece of pink paper. Of course I didn't! Why would I have a piece of pink paper? Apparently, they only help people with a pink paper. You have to first get a piece of pink paper from the department you are visiting, in my case, the dermatology department. Nobody had thought to tell me this. Two hours of my life wasted. I hate that. The nurse called someone to take me to dermatology, two car parks and three buildings away. Now clutching the piece of pink paper, I once again joined the queue. Some people who had been queueing almost as long as me took pity and let me go to the front and push my piece of pink paper through the little window. I saw why the whole process took so long. No computers in sight, everything written by hand. Painstakingly. Cindy was written down as Cinci. At that stage I was beyond caring. It was already 11am. I had been there since 8.30am. After handing in my paper I was told to sit down and wait. At last I could read my Kindle. After fifteen minutes I decided it might be a good idea to try and find out what happens next. I once again rejoined the queue at the second window where it appeared you had to pay. Of course, being a foreigner I knew I would get charged a lot more than the locals. Another nurse who had been in the queue at 8.30am came into the waiting area. "Oh Mama you are still here! I have been and gone, been and gone and am already bringing in a new patient!" My smile was a little sickly. It was 11.20am. The nurse saved my life. I was ready to slit my wrists if I had to wait any longer in a queue. She shouted over the crowd, got those in the front to pass back my new file, and escorted me back to dermatology where I could pay instead of at the main hospital area. $38, not too bad. My specimen was put into a very official-looking test-tube filled with formalin. However, the dermatologist told me that I should not be too impressed, because at the very best there was a less than fifty percent chance of getting the results back from the pathologty lab. They lose it, or the power is out and the machines can't work, or they forget about it. So maybe we will never know what was growing out of me! The whole visit lasted four and a quarter hours. Isn't life here grand? 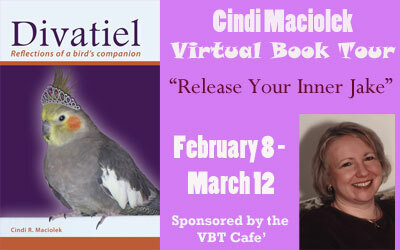 My guest post today is from Cindi Maciolek. Cindi R. Maciolek is a writer and business consultant, whose published works include Divatiel: Reflections of a bird’s companion; Java Jems: 5 Minute Inspirations for Busy People and The Basics of Buying Art. She’s also a contributing author to the books Life Choices: Pursuing Your Passion and Life Choices: It’s Never Too Late. Maciolek has written numerous articles for the luxury marketplace, including the Robb Report and Luxury Las Vegas. Maciolek lives in Las Vegas, Nevada. www.cindimaciolek.com. 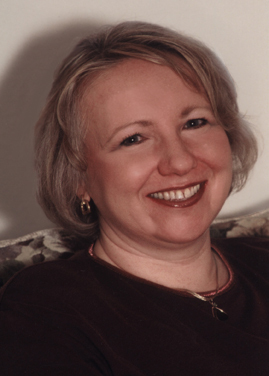 Cindi has written a great post about whether to write using long or short chapters. It's definitely thought-provoking. Personally, I prefer short chapters. As I read every night before going to sleep, I set myself a chapter as a goal. If the chapter is too long and I'm getting tired, giving each eye a chance to stay open, I get frustrated. In my own writing my chapters tend to be short, averaging about 1400 words a chapter. I find this moves the story along much faster. But enough about me, let's hear what Cindi Maciolek has to say on the subject. Lately, it seems, I’ve been chatting a lot with people about chapter length. So, I thought I’d put some thoughts together and get feedback from a larger group. Perhaps you think about it when you read, maybe you don’t. The question is, how does chapter length affect the reading experience? From my personal perspective, I prefer shorter chapters. I’ve worked in the business world for so long that I’m used to keeping things short and sweet. Many business people I know read particular magazines simply because most of the articles are confined to a single page. In this crazy, busy world, there’s a sense of accomplishment learning something in such a short period of time, as well as being able to complete the task of reading the article. Dan Brown keeps his chapters nice and short. It helps to maintain the speed of the novel. Of course, when a book takes place within a 24-hour window, speed is of the essence. However, I quite enjoy some of those chapters that are a mere one page in length. I’ve spoken to readers of historical and romance novels and they tell me they prefer the long length of some of the chapters, that it’s necessary to absorb all the detail. I can’t say I’ve read books many in those genres, so I can’t personally comment. But, it made me wonder if chapter length should differ among genres, and how many writers take chapter length into consideration when they begin a project. I’ve always enjoyed books where chapters averaged about 10-15 pages, so I try to limit mine to about 2,500 words. When I sit down to write, I let the words flow. I have an idea of where I want that chapter to go, but if it starts to get unwieldy, I end it at an appropriate point, and begin a new chapter. Sometimes, the idea for one chapter actually takes three. I’ve written mostly non-fiction, but I’m currently knee-deep in a chick-lit novel that I love, love, love! I’ve also written some other novels that I’ve not yet published. Whether by chance or by choice, it seems I’ve kept to that 10-15 page chapter length all along. So, I’m curious. What are your thoughts on chapter length? As a writer, do you think in-depth about the word count of each individual chapter, or just the overall word count? As a reader, do you think chapter length affects your reading experience? Do you prefer short or long? 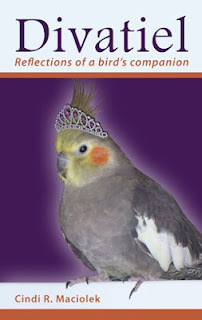 Cindi's latest book is Divatiel: Reflections of a bird's companion. Can four ounces of feathers and personality change a person’s life? She can if she’s the Divatiel! 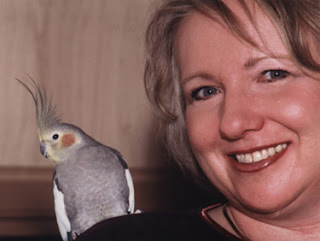 Cindi was looking for a roommate, and finally settled on a fine-feathered friend who was a gift from a co-worker. What she got was a loving, intelligent, fun, free-spirited, demanding – Jaké. After recovering from illness that put her near death’s door, Jaké healed and was let out of the cage so she could spread her wings. She lived her life with gusto. Jaké took risks, used her intelligence to her advantage and loved unconditionally. She took charge, not only over her surroundings but over her owner as well. Luckily, she had a cooperative Mommy in Cindi. Not only was she demanding, Jaké did things some humans have never done. She flew on an airplane several times, went on numerous road trips and ate fresh vegetables daily. Jaké lived a very long life and had many adventures along the way, most of which are captured in this book. Jaké was first a gift to William, then a gift to Cindi, and now a gift to the world. 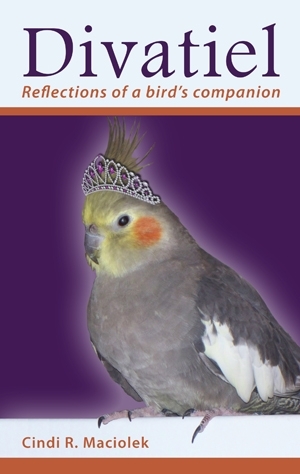 Divatiel: Reflections of a bird’s companion will tug at your heart strings and bring a smile to any animal lover. When I was young there wasn't much in the way of YA fiction. I found myself at the age of 12 reading Wilbur Smith, John le Carre, Robert Ludlum. At age 14 I'd progressed to Leon Uris, Frederick Forsythe, Thomas Hardy, E.M. Forster, Chaim Potok. After that I devoured anything and everything, except science fiction and horror. Those gave me nightmares. Nowadays there are far more choices for YA readers. It is always exciting to find a worthwhile YA author who writes books with a high interest level for teens. Joana James is one such author. Joana James is a 28 year old author from the island of Saint Lucia in the Caribbean. She is an I.T. professional by day but in her free time she escapes from the logical world of technology into the artistic world. She is an avid reader and her kindle is her favourite piece of technology. Music is her best friend and that manifests itself through her love for dance and singing. Joana writes stories that portray the reality of her world. Her first book, a two-part short story series called Rise from the Ashes featured the lives of two young girls struggling in dire circumstances. Her latest book, Nightmare at Emerald High, brings to the fore a world that everybody knows exists but no one talks about. "My love for writing met my love with youth about two years ago and formed an inseparable bond. For approximately six years, I worked with my church youth department helping to mentor and lead teens. When I decided to take my writing seriously, teens found their way into my books quite naturally. I’ve seen several situations unfold before me where I’ve had to offer advice and a shoulder to lean on. These situations often find their way into my books. Reaching out to teens through my writing is my number one goal. For me, being able to tell the stories of those who find it difficult to do so themselves is quite rewarding. I love to tell the stories of those who may be hurting or are forgotten. With every story, my hope is that some young person may find enlightenment or, they may just find the answer to a question they found difficult to ask. If I could touch just one life, prevent one suicide and encourage one person, my job is done. Nightmare at Emerald High may seem a bit controversial with its subject matter being secret societies and organizations, but in the society that I live, it’s an everyday thing. Our children get tangled up in so many things that warp their thinking and confuse them and their perception of good and evil and right and wrong. My hope is that Nightmare at Emerald High will be an eye opener for both parents and teens.
" Most failures in life are failures in commonsense." 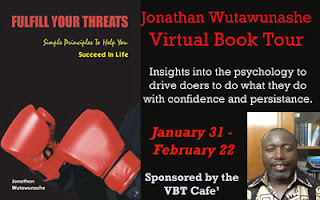 When I was given the opportunity to host Jonathan Wutawunashe on my blog I was very excited. 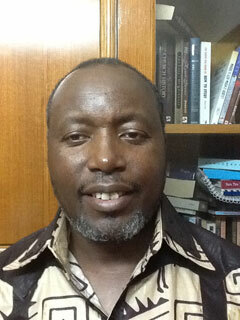 Jonathan is from Zimbabwe, one of South Africa's neighbours. Zimbabwe gets so much bad press in the news, it is great to be able to celebrate something good from Zimbabwe for a change. 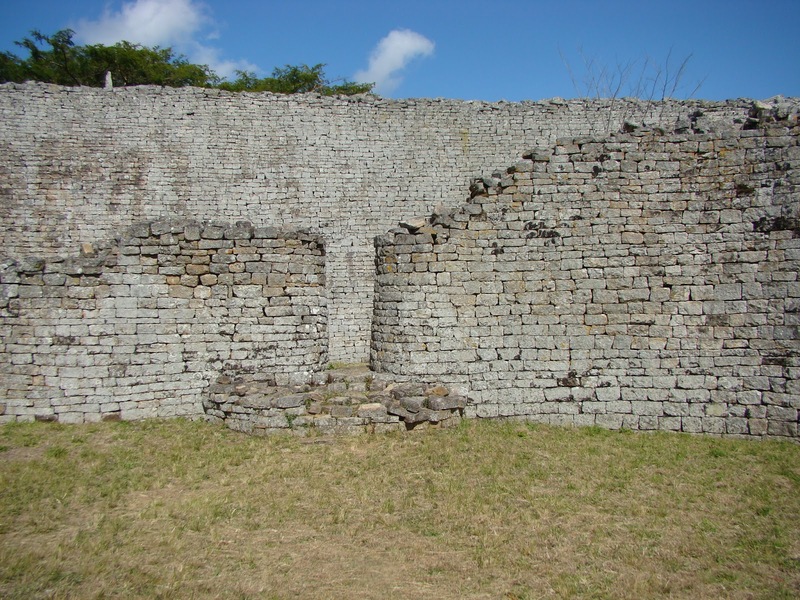 Having traveled through Zimbabwe on numerous occasions, I have to say it is a beautiful country with a fascinating history. Jonathan has written a great book on how to realise your dreams called 'Fulfil your threats.' He shares with us a post he wrote about lessons he learned from his sister Edna. When my sister Edna was born, I remember that the entire family was excited. Her most obvious mark of uniqueness was that she was the first and only girl in a family dominated by boys, but as time went on, we all realised that her uniqueness did not stop at gender. For one thing, she was gifted with a mighty pair of lungs, which, as an infant, she employed to great advantage. When she was disappointed in any way, you did everything you could to stop her crying; the way we all got destabilized and frantic, you would think world peace was at stake! I think that Edna decided from that early stage to live her life as an accomplisher and an influencer of people. I intend to do three posts on aspects of my sister’s personality that I have found to be worth emulating, and that I believe represent important traits of an effective person. In this post, I shall focus on Edna’s incredible drive. I was surprised when, at the age of nineteen, Edna announced that she was joining the Police, and was being assigned an entry-level job at the General Headquarters. Naturally, I was happy that she had found employment at that early age, but I was at the same time a little apprehensive about her prospects in a career then largely dominated by males. Elder brothers tend to be protective, sometimes overly so. I was therefore genuinely attentive whenever she talked about what was happening at work. I wasn’t sure, though, if I was hearing right when she briefed me about the rapid progress she was making as a rookie, but it was hard to miss the enthusiasm with which she described details of her training and other aspects of her life in the Police. Edna’s enthusiasm was simply infectious, and I could tell that she was throwing herself into her chosen career without reserve. While kind people have cited us as a family of achievers, I honestly believe that our sister takes pole position where absolute commitment to a chosen course of action is involved. The manner in which she seeks all kinds of skill and knowledge that relates to the pursuit she is engaged in makes the point I try to make in my book on the necessity of empowering oneself with relevant knowledge much more convincingly than my prose does. In just a few months, Edna was regraded favourably in her job, and there was talk of her pursuing an accelerated and very promising career path. 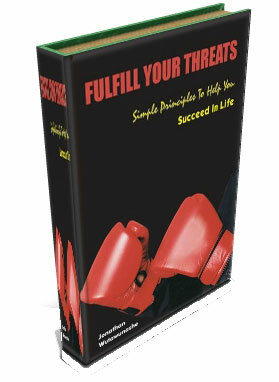 What impressed me was her determination to wring every opportunity for whatever sap it contained, a procedure that entailed taking every training course that dared present itself in her path. She left the organisation she worked with with no option other than to keep upgrading and promoting her. One of the courses she pursued with fervor was secretarial training, and I remember being briefed in detail from the thirty words-per-minute stage, through eighty to one hundred and twenty. As a result of her commitment to higher attainment, Edna quickly became a force to reckon with, and was assigned to high offices. When she announced her intention to move on, Police General Headquarters, I am sure, felt greatly deprived. Edna’s next stop was the Headquarters of a large telecommunications concern, where, once again, her enthusiasm and drive quickly propelled her to prominence. Like all successful people, she continued to define herself as a thirsty learner, allowing herself considerable lateral vision, which exposed her to several life opportunities. Because I am her brother, I got to meet many people whose resumés were remarkable, and some of them have remained family friends. It fascinated me that my little sister was being cited as a mentor and opinion leader by so many people, some of whom had titles that ranked higher than her own. What an influencer! People who have drive are constantly seeking opportunities that test and exercise that drive, and in that quest, they touch many lives. A combination of drive, peripheral vision and lateral thinking created an achievement that I marvel at even today. At a time when the real estate market was severely constricted, Edna spotted an opportunity that I must confess I was at first sceptical about. This opportunity involved a rather complex investment scheme that promised high and rapid returns. People who possess Edna’s kind of drive and determination tend to be good at seeing gains where lesser mortals see only risk. Once she committed herself to the scheme, my sister concentrated a phenomenal focus on making it work. Indeed, as I write, it strikes me that Edna is a true illustration of the admonition I put in the chapter of my book where I discuss management: “when you pay money, you had better pay attention.” The outcome of this concentration and unrelenting drive was a very impressive suburban home. Ambassador Jonathan Wutawunashe cut his teeth as a diplomat in Washington, DC and New York during the 1980s. Educated and trained in his native Zimbabwe, in Australia, the United States and Belgium, Wutawunashe played key roles as a top manager and leader in key posts and functions in Zimbabwe, North America, Europe and Asia. One of his more widely publicized accomplishments was his presentation of the case against nuclear weapons at the International Court of Justice in November 1995. Ambassador Wutawunashe is a sought-after speaker and counselor who has motivated audiences at universities, churches, training seminars, trade symposiums and in other contexts in Africa, Asia, Europe and North America. His personal achievements include writing for magazines and academic journals from an early age, musical compositions and an extensive discography that has caught the attention of researchers and writers on global culture. He has done creative work for television, for which he has received plaudits, and has also established several audio-visual recording and mastering studios. The Ambassador holds post-graduate degrees in literature and social sciences. He is married to Shuvai, and the couple have three children, Tinashe, Tendai and Paidamoyo. You can read more about Wutawunashe on Wikipedia: http://en.wikipedia.org/wiki/Jonathan_Wutawunashe. This incisive, well-written book shares profound insights into the psychology that drives doers to do what they do, and to do it with confidence, method and persistence. Its energizing claim is that we can all be effective doers if we take simple steps to yank our ambitions from the realm of idle thought and idle talk, and to mobilize those dreams and aspirations into projects that achieve results that can be seen, touched and experienced. Wutawunashe draws from experience and observation to illustrate how business ideas, personal development efforts, social influence and other schemes can be pursued in a manner that assures effective, sustained impact . In an engaging style that melds entertaining anecdotes, humorous turn of phrase and powerful didactic principle in a uniquely seamless manner, Wutawunashe delivers a powerful manual that could well come with a warranty, given the ease with which the reader can apply these lessons and see results.